My friend Redqueen and I started this project about a year ago. 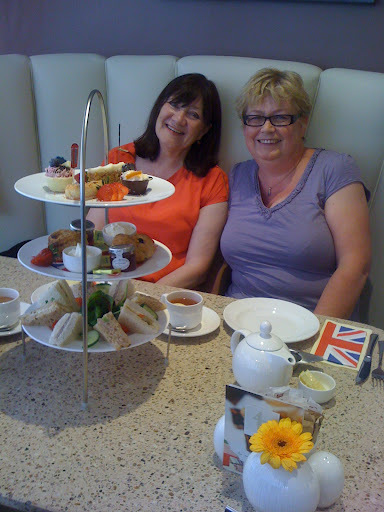 At first we would meet up under the pretence of visiting an art gallery or some other cultural interest, but eventually we abandoned the pretence and just went for the tea. and a chinwag. So this has been in the archives for ages waiting to be finished. Then I realised that it is never going to be finished. 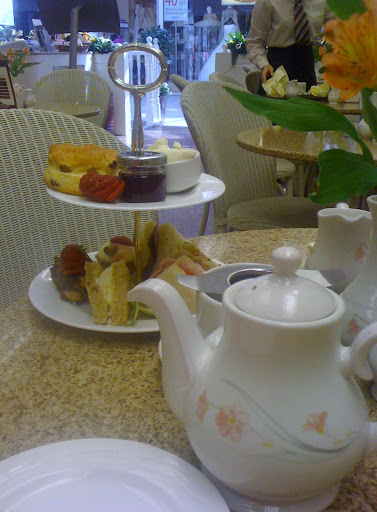 Tomorrow we are continuing our research by returning to the Richmond Tea rooms, because I didn’t have any pictures. We will see if this place is a good a second time and I promise to get pictures. 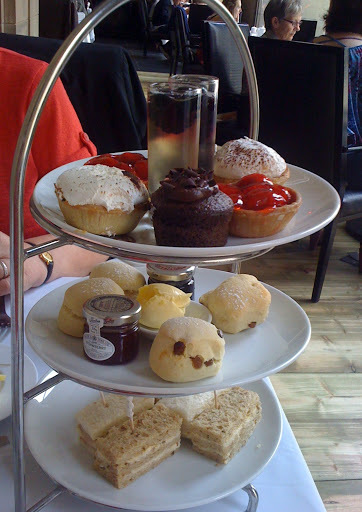 We went back to the Richmond tea rooms, my personal favourite, as I had no photos and I will post this account separately soon. At the restaurant, first impressions were really positive, as we were greeted by a charming and polite young lady who showed us to our table and continued to refer to us as “ladies” throughout. The greeter told us they had a “jubilee theme” and a “surprise” for this week, but this just seemed to consist of a sparkler and union jack paper serviettes. I am not sure whether the plan was to play the national anthem, when they served the food (God forbid! )…but it didn’t happen thank goodness. 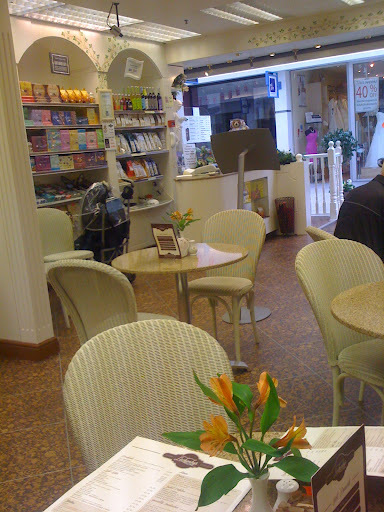 Still the very good selection of loose leaf teas came first,followed by the tea stand. The sandwiches were excellent, obviously freshly made and a good selection of beef and mustard, tuna and cucumber, egg mayonnaise, and something else with capers. The cakes on the top were from Slatterys. 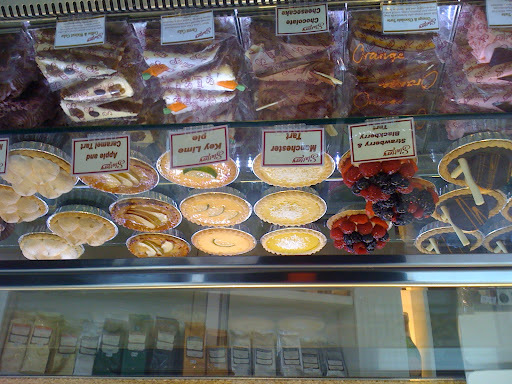 A very well known and renowned local patisserie. The whole thing was garnished with delicious fresh strawberries. So we spent a pleasant couple of hours, catching up, discussing our travels to Crete, Estonia and of course Paris. Debating the question of monarchy and republicanism and the Jubilee. This conversion of the historic Free Trade Hall is luxurious and the décor stunning. We were shown to the glass covered bar overlooking the street. The waiter asked if we had any dietary preferences for the sandwiches and we said we did not like smoked salmon. Unfortunately when the tea came there were smoked salmon sandwiches on the plate. 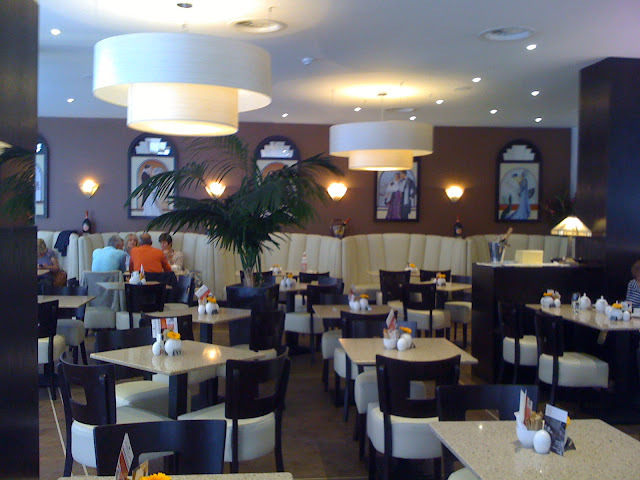 The waiters seemed very pressured, even though the place did not seem that busy and it took a while to get somebody’s attention, when we did they rushed away saying they would be with us in a moment. This took about ten minutes. 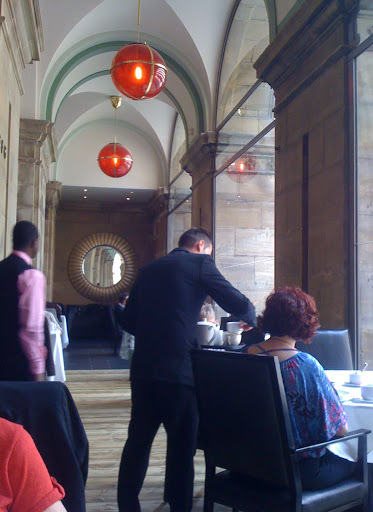 Although the wait staff were polite, I felt that the calm ambiance of the lounge and afternoon tea was spoiled by the busyness of the waiters. I think good waiter, like a duck may be peddling furiously underneath but remain calm on the outside. They should be invisible, but available when you need them. Eventually when the smoked salmon was removed, unfortunately the rest of the sandwiches were tainted with the strong flavour of the smoked salmon. I should have sent them back a second time but the first time had been such an effort I just left. it. This was a christmas present from my daughter which came in the form a metal pebble. So I took Michael with me. We were asked what kind of sandwiches,we wanted from ham, tuna, egg and cheese, and not given a selection. 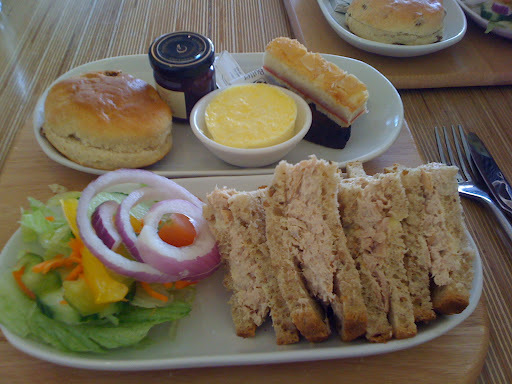 The scones however were particularly delicious light and fluffy but were were just given an almond slice and a piece of fruit cake as the cake selection…a bit of a disappointment in such a renowned cake shop. 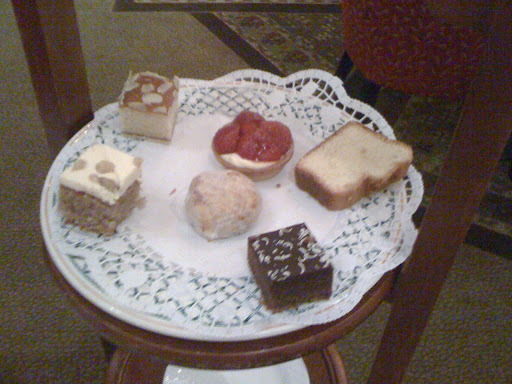 However, I now know that this is more in keeping with the traditional afternoon tea, which did not include cream cakes but plain cakes like almond slice or fruit cakes. Once Manchesters premier hotel, sadly the Midland has been overtaken by it’s newer rivals the Raddisson and the Lowry. The Octagon lounge is a bit dark and dreary for my taste and the public areas could do with a make over. The tea however was fine and the service was good. 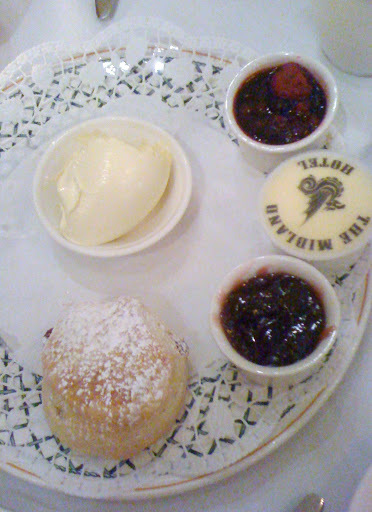 The preserves and jam with the scones was especially tasty. The sandwiches were fresh and NO smoked salmon, but poached salmon on rye bread which was delicious. 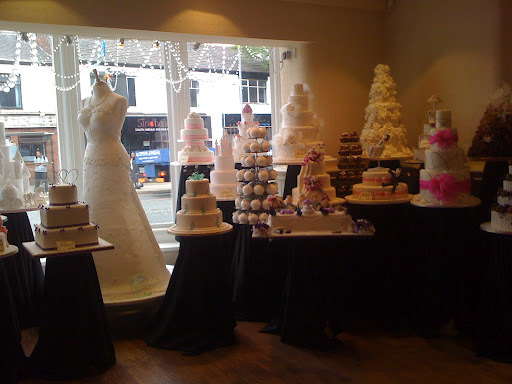 The cakes were a bit plain and we cut them in half as there were not two of everything. 27 Minden parade, Mill gate shopping centre Bury. 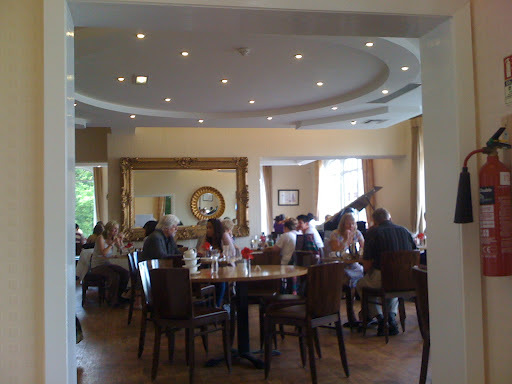 Michael and I came across this lovely tea room one Sunday when we took a trip to Bury when we were bored. Bury is a lovely town to visit 15 minutes on on the tram from Manchester,for a tourist. Go on a market day Wednesday, Friday or Saturday. The best market in Europe I have ever seen. A typical Northern town. Slatterys and the service was good too. Previous post ← HALLOWEEN! HELP! It's good to see the photos of Slatterys and Leckonbys as I've never been to either of them. 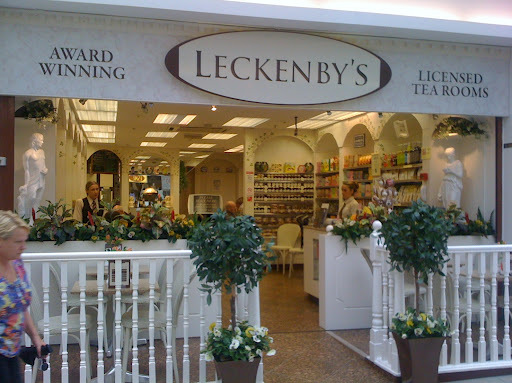 Is Leckonby's where we are going later this month? Hope so anyway! 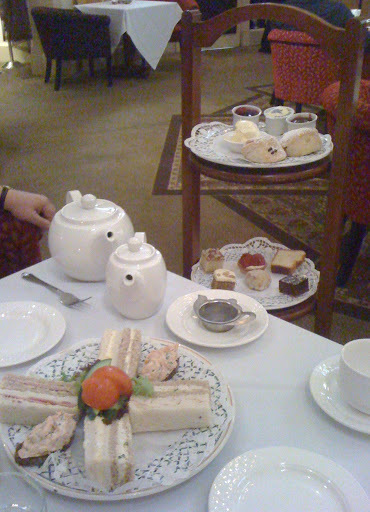 I enjoyed afternoon tea at the Merchants Hotel, Belfast on my recent trip, easily up there with the Midland and 47 King Street West. 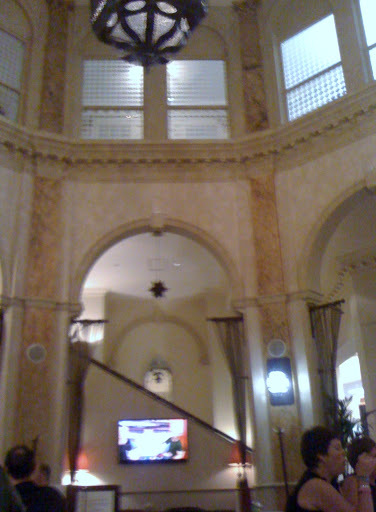 I really missed out in New York as apparently the Palm Court at the Plaza Hotel is THE place for afternoon tea. We just went in the food court there and had tea and a cake which was very nice.Looking forward to this afternoon! Harriett by email11:34 (10 hours ago) Just wanted you to know I really liked the tea time series andespecially the photos. 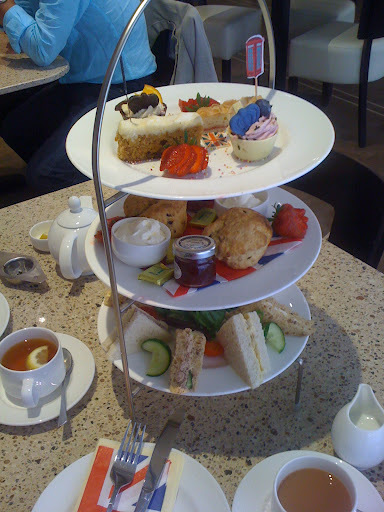 I have been to England several times and havenever done tea time. I must do it on my next trip!